Good Monday Morning! Hope you're enjoying the final days of summer. I can't believe that Autumn's almost upon us. You can feel the crispness in the air and it's starting to get dark here just after 8 p.m. I must say that i've enjoyed a wonderful summer, but I always look forward to Sweater Weather! To keep your images simple and to cut down on colouring time, try shading the image just a bit to add dimension. I used BG10 to do this, but cool gray works well too! I added Fuchsia Flower Soft for the Flowers and Shamrock Green for the Foliage. Initially I added my Fuchsia mix to the bouquet, then went in and added the Shamrock Green. I found the green a little overpowering, so I simply added more Fuchsia, which gave me a fuller bouquet and became the predominant colour again. Lesson: If you're not quite happy with the result you achieve, just let your area dry for a bit and add more! The card itself is very simple. I cut the image with my nestabilities. Then I decided to use my Copic Airbrush system to do the shading around the edge of the card. The DP is Lily Kate from Basic Grey and I edged the paper with a SU border Punch! C4C52 Kraftin' Kimmie's Saturday Challenge, An Announcement AND some Candy! It's Saturday which means it is challenge time with the Crazies!!!!! and the Kraftin' Kimmie challenge too~! This week Frances is back with another fun challenge. But before we get onto the challenges, I have a little announcement to make. This is my last challenge with the crazies. This is sad for me because Cindy, Frances and I founded this challenge blog about a year ago. It has been AMAZING to work together and watch the blog grow successfully with a HUGE following. 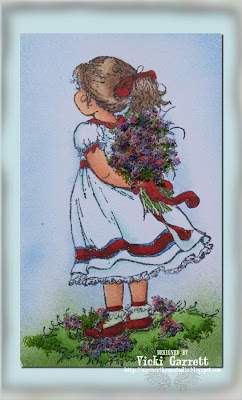 If you've been following my blog, you'll know that I'm paring down some of my commitments to make more time for teaching............so I will totally miss Frances, Cindy and the rest of the Crazies.....it's been an awesome year and I hope to play along occasionally! I'll still be here designing, but on a smaller scale. Now onto this week's Crazy challenge. Lattice .... this week we are going to include lattice in some form on our cards. Here are a few ideas to get you started ... lattice using your circuit machine, dies, embossed lattice using scor-pal; Lattice Punches; Designer paper that has lattice pattern, lattice background stamps or image stamps that include lattice on them; etc. 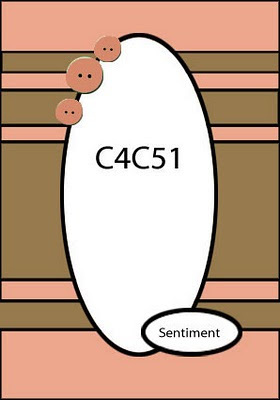 If you would like to play along with us, all you have to do is create a card/project, and upload it to your blog and/or to your SCS Gallery using the keyword C4C52. Don't forget to go back here and link it on Mr Linky so that everyone else can see it too. Jeanne is our Hostess extraordinaire for the Kimmie Saturday Challenge to get all the details on how to link your creations up to the challenge, click HERE . The challenge is to use white and pearls! 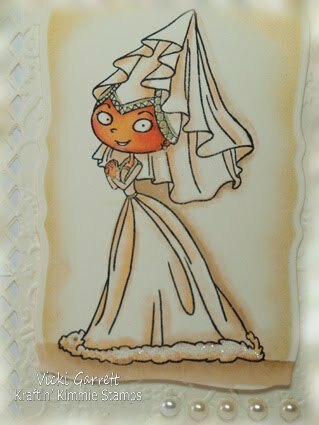 I made my card in Ivory, with a white card base.........I added very little colour to my image, shading the dress with Sand White. Pretty Princess Petunia doesn't look to shabby, if I don't say so myself! I used a Martha Stewart Border Punch to add the Lattice border to the Cuttlebugged (Brocade Panel) and the half pearls are from Stampin' Up! And now, if you're still reading..............the Candy! I was excited to see my followers surpass 300 today! I wanted to show some appreciation for that and have a Stampin' Up! Scallop Trim Border Punch up for grabs to one reader who comments on this post. I'll leave the post open until next Friday at Midnight and announce the winner with next Saturday's Kraftin' Kimmie Challenge. The Catch??? You must be a follower to win! I'll sweeten the pot with some suprises with each additional 5 followers that add on this week (as of this post, I'm at 301) if you want to spread the word, that would be great, but it's not a requirement to win. I'll add pictures through the week when I add the prizes~! 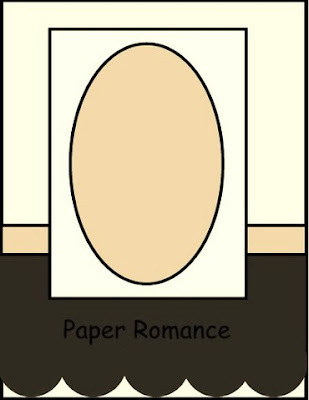 I'm sad to say that this is my final challenge with Paper Romance as I've had to clear my slate a little bit to focus on teaching. There are never enough hours in a day. I'm sad to be leaving and would like to say a big Thank you to Amy for being such a wonderful chickie to work for. I will truly miss the camaraderie with the design team chicklets as they are a wonderful and oh so talented group of girls. This week, my sweet friend Cindy is bringing us this fabulous sketch. If you want to play along with the challenges, be sure to post a direct link to your creation here on the challenge blog. You could be the random winner of a $5.00 Gift Certificate just for entering your card. 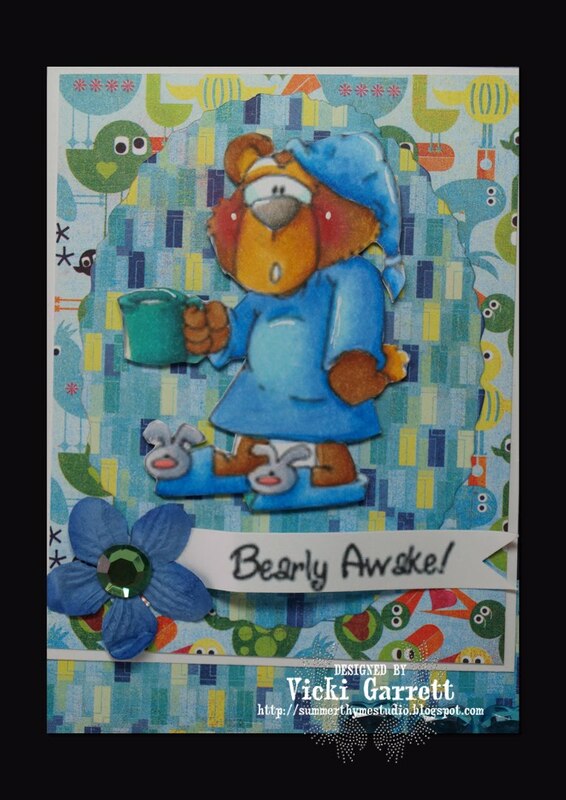 For my creation, I used Sleepy Bear, one of the newest releases from High Hopes Dustin Pike Summer collection. He's coloured with Copics and I used some bright DP from Basic Grey Lime Rickey Collection. What a cute cute image eh? You can also get the sentiment to match! Hope that you'll play along and continue to visit Amy and her wonderful design team! This week, the ever so sweet Kaz is our challenge hostess. One of her nieces is turning 16 and she's challenged us to create a not so sweet 16 card! Guess what??? Stampotique has sweetened the pot for the winner of this challenge. 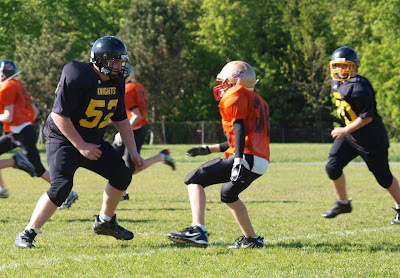 One random player can win a $25.00 gift certificate . Remember this week is Stampotique Stamps only! 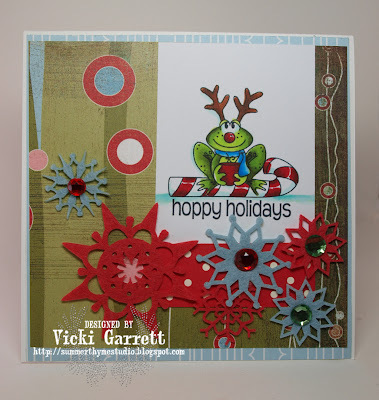 Make sure that you link your card up HERE on the Stampotique Designers Challenge Site to get a chance to win! 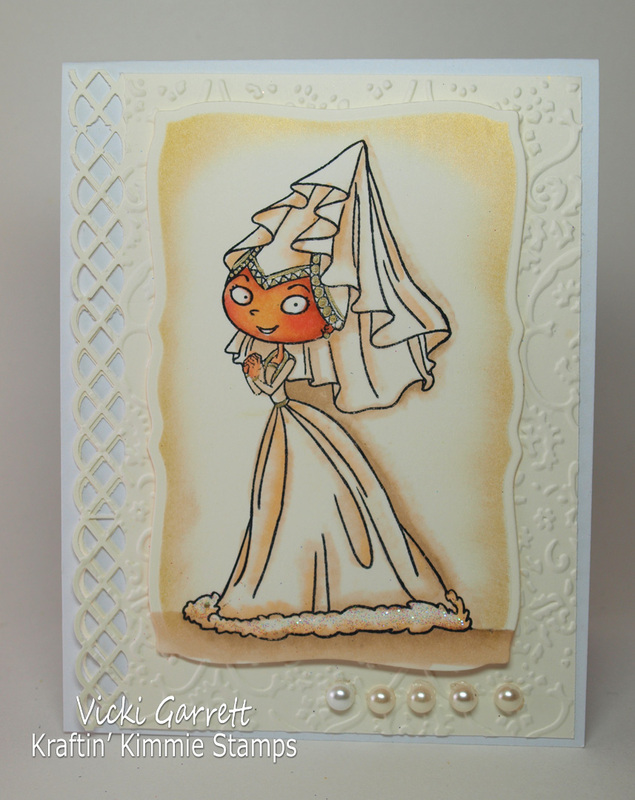 For my card, I used 6002 Baby Cakes, I think she looks a little cheeky! 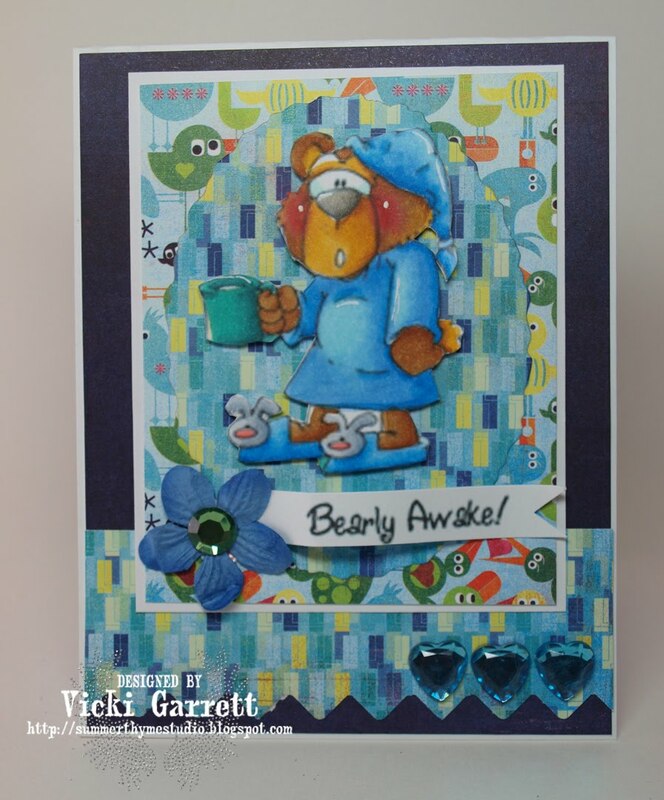 To make quick cards with your images, you can opt for paper piecing and glitter! The only lick of colouring on this card was skin and hair! I made this card in a jiffy! 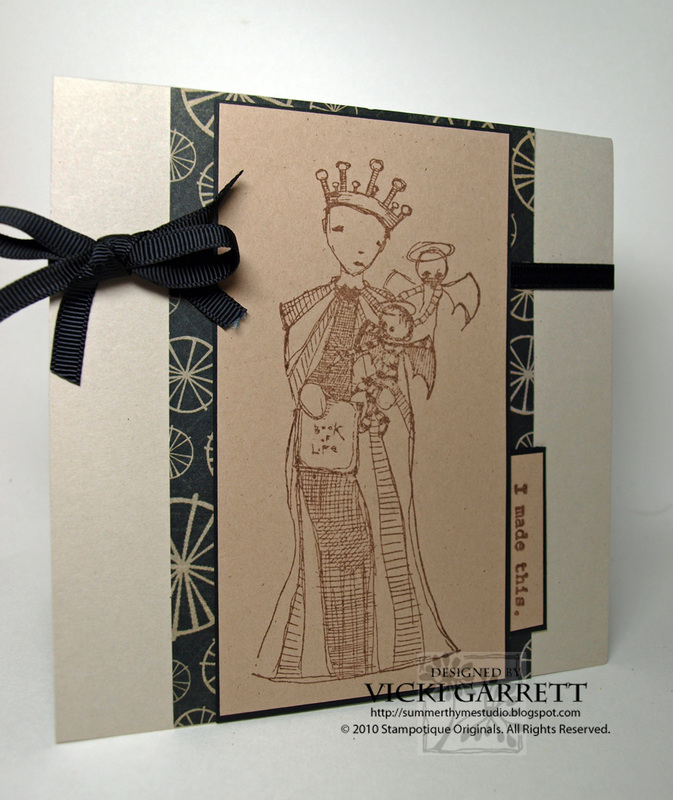 Chocolate Brown Cardstock and Felt Flower: SU! The winner of the Mistletoad set is Stephanie! Stephanie has been graciously contacted by Heather with all the details of how to claim her prize. Thanks so much for stopping by and leaving your sweet comments! Are you ready for another Crazy 4 Challenges challenge?????? This week Frances has a sketch challenge for you to play with. 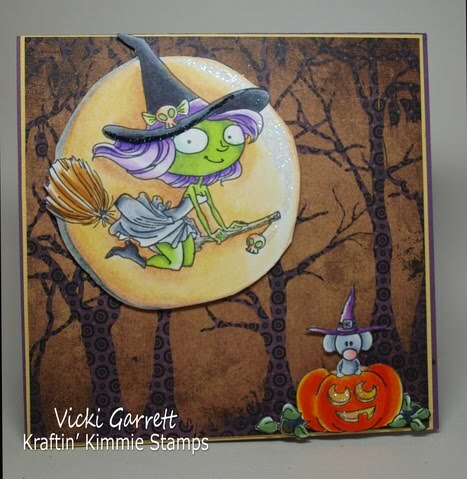 Over at Kraftin' Kimmie Stamps, Diana has us seeing stars! The C4C challenge this week is also our prize challenge being it is the 3rd Saturday of the month. This month our prize is sponsored by Alota Rubber Stamps. If you would like to play along with us, all you have to do is create a card/project, and upload it to your blog and/or to your SCS Gallery using the keyword C4C51. Don't forget to come back here and link it on Mr Linky so that everyone else can see it too. With the Kraftin' Kimmie Challenge, pull out your favourite KK stamp and dazzle us with Stars!!! 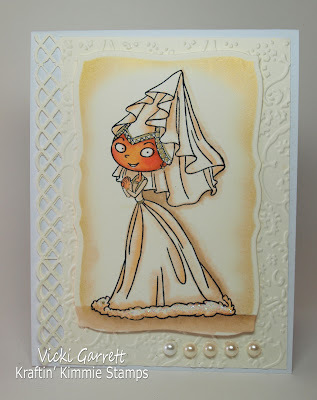 You can win the stamp that Diana is featuring on her blog for this challenge! Hope you all have a fabulous weekend. I'm off to shop in New York State...........Jon's in need of some new duds for school! I am THRILLED to be playing along with the Our Craft Lounge Design Team and friends to showcase Our Craft Lounge's Latest Release! There are so many new sets to choose from and if you've been following OCL for the last few days, I'm sure that you have seen a lot of fabulous Samples. Today and up until this Sunday, you have the opportunity to win a fabulous OCL set by leaving some love on the blogs all along the hop! Winners will be listed on the OCL blog some time next week! you can get all the scoop there! 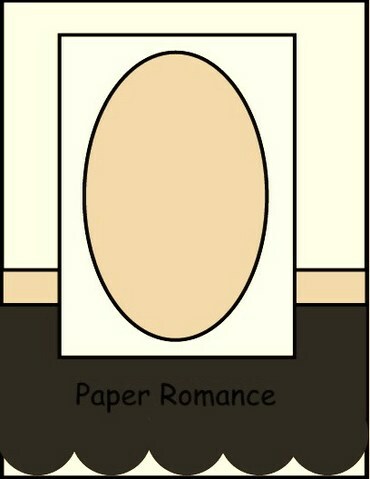 Well maybe not so heavy.......with that Title I suppose you might have been expecting pics of Angus Young or Axle Rose?.........It's time for another Paper Romance Challenge! This week Amy is our host and she challenged us to include a metal embellishment on our card. This Sweet image is Couples Cruise from High Hopes Dustin Pike and can be found at the Paper Romance store. My wee embellishment is a tiny metal Noah's Ark charm.........Sweet!!! 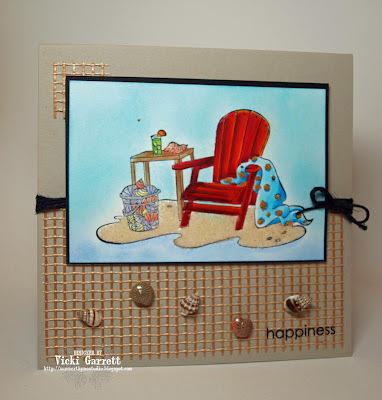 Kratin' Kimmie's Krafty August Hop! 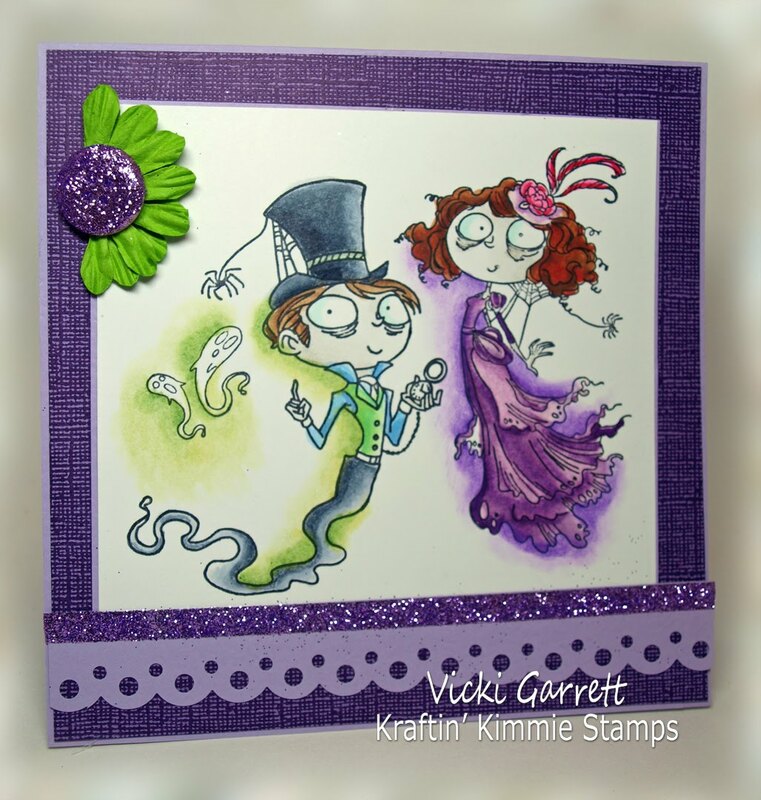 Today Kraftin’ Kimmie Stamps is releasing their new spoooooooooky August images! 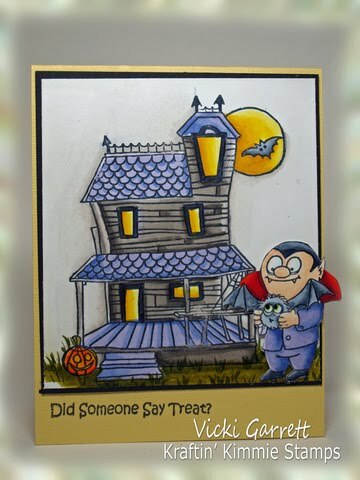 As you’ve seen over the last few days in our Krafty Peeks, Annie Rodrigue has created some super cute and creepy designs! There are eight images in the complete set and one of them is a very special one that we have created from Annie’s original painting, Batty Princess! And Steven Leary is back with Miles the Mouse and his ghoulfriend, Maisie along with some new fun characters! They are having a lot of trick or treatin’ fun and you’ll get to check them all out in today’s August release day KRAFTY HOP!! If you've been Hopping already, you've just arrived from Paula's Blog ! Isn't her work just divine??? 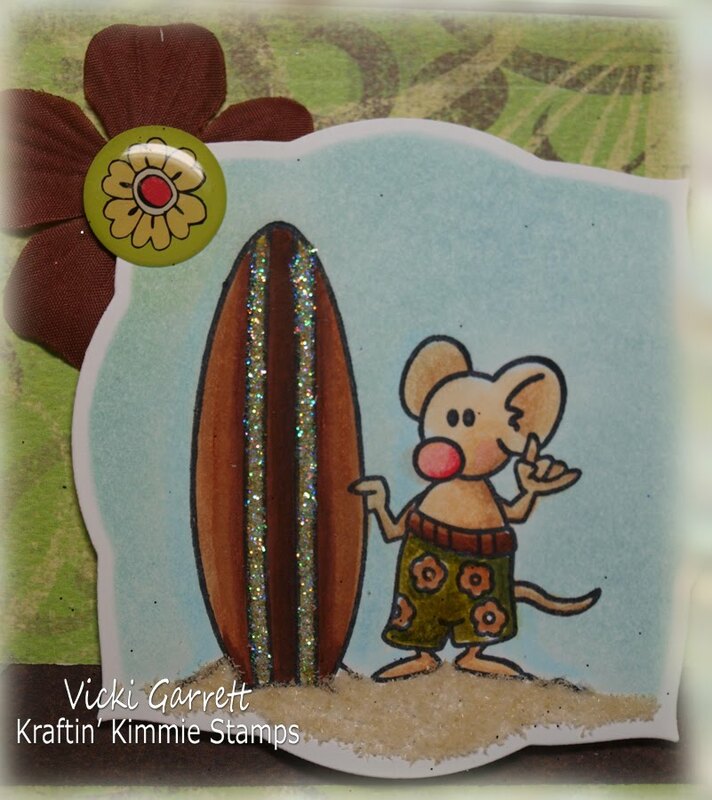 If you want to start from the beginning, just head over to the Kraftin’ Kimmie Challenge Blog! 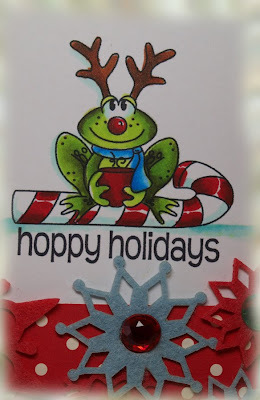 As you hop from blog to blog, be sure to leave a comment at each and every stop because some lucky stampers will win packages of stamps from the new release!! And when you’re done hoppin’, be sure to head over to the Kraftin’ Kimmie shop, because ALL the new images are NOW available! OH and did we mention? Each and every order placed this week, will be entered into a draw?? One lucky customer will win a 5x7 print of Annie’s Batty Princess!! Also we’re doing something new this month!! For those of you who just HAVE to have all the new images, we’ve got the perfect thing for you! It’s called the ‘Gimme Kimmies Kit’!!! Instead of clicking on each image that you’d like, you only have to click once to pick up a Gimme Kimmies Kit AND it’s at a discounted price!! What could be better??? I Stamped Ms Poo..........lol.................Witchy Poo and Drew the moon in behind her. Although she is coloured in Copics, the Moon is done with Prism Pencils!!! The DP is from Basic Grey and Miles is in Copics as well! 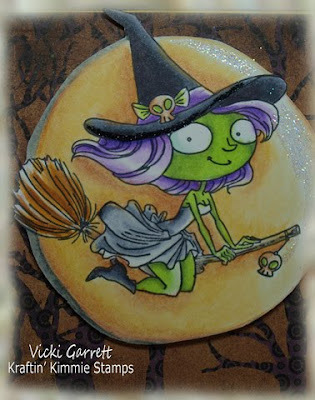 I couldn't resist making her green like my Fave Witch........Elvira Gultch! The Wickedest Witch EVER!!!!! 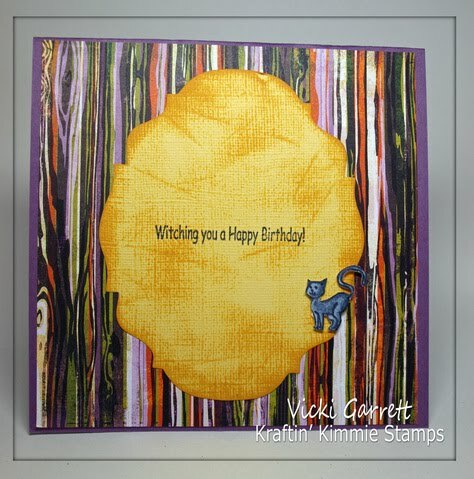 I couldn't resist using her little Kitty as an embellishment along with Kimmie's new Halloween Sentiments. Finally, Mitzi Mummy's on the prowl for a Wrap! She finds that those Heavy Bread Sandwiches go straight to her hips!!!! I coloured her with Copics, doing all her shading with Prism Pencils.........Did I mention that Paula got me hooked on those pencils!!!! to see what she and her super crafty Daughter Kaitlyn have to show you! Leave lot's of comments along the way and some spooky images could be yours! Kraftin' Kimmie's Saturday Challenge #41-Bling, Buttons and Scallops! 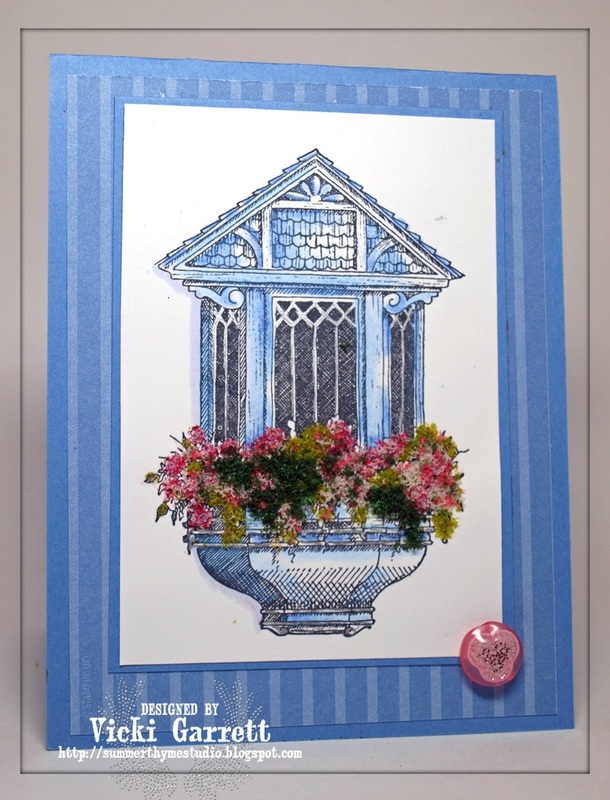 This week, Krafty Krista challenge us to use Buttons, Blings and Scallops on our Cards! In addition, these two sweet images are Hattie and Horace, two fabulous images available for this August Release. I coloured my images with Prism Pencils and Gamsol. My button, I covered in super cool Purple Glitter by running it through my Xyron Machine and dipping it in the glitter. 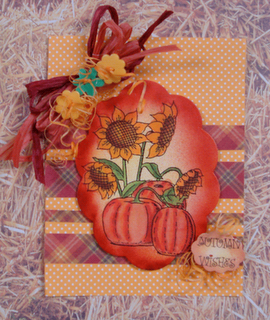 I then ran a line of Sticky Strip over top of the MS punched border and sprinkled with MORE GLITTA! One can never get enough Bling on a Card!!!! The flower is from Prima! 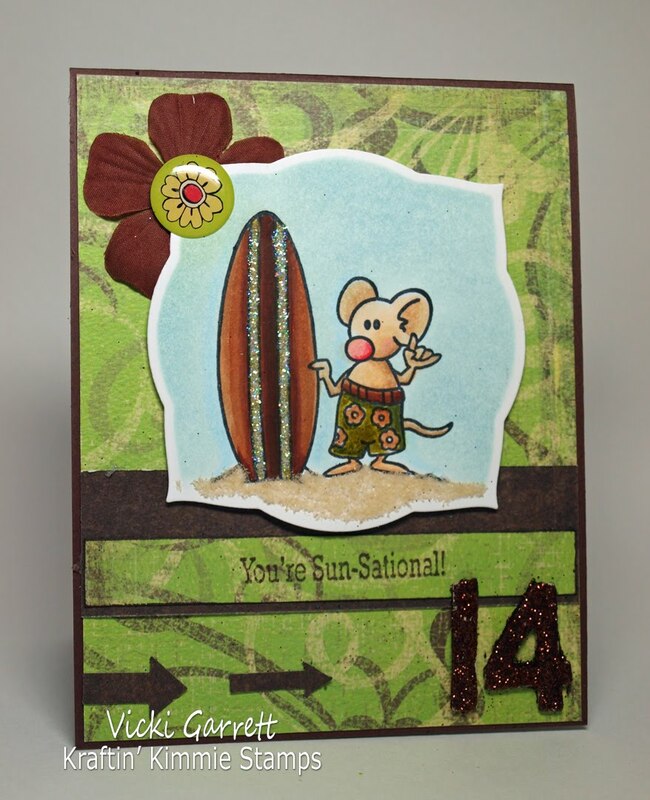 If you play along with the challenge, you could win the stamp that Krista is featuring on her blog for the challenge! 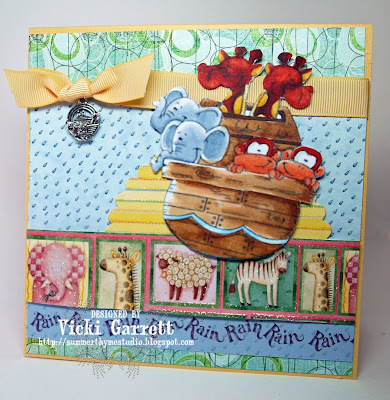 Sooooo pull out your finest Krafty Stamps and Link up your creations on the Challenge blog! Don't forget to come and hop with the Krafty Girls and the Super Talented Krafty Girl Friends!!! 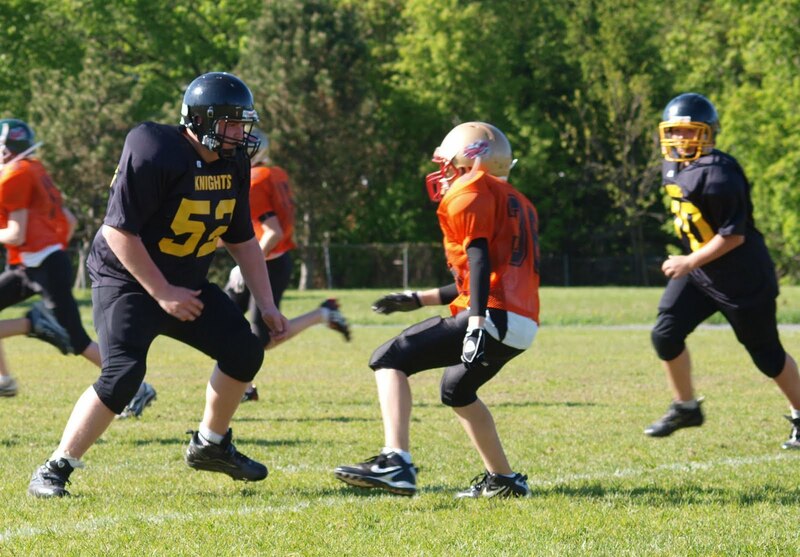 It all starts tomorrow! C4C 50-I'm all shook up!!! lalallalalalal!! This week my incredibly sweet and creative friend Frances is our Challenge Hostess! When she first started thinking about what to do for the challenges in August, she decided to check out what special days were in August. in researching this online I discovered that the 2nd week of August was Elvis week which coincides with the anniversary of his death on 16th August 1977. 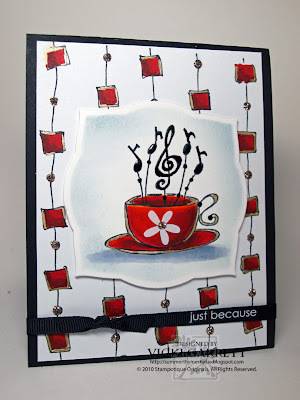 "So my challenge for this week is that you need to include music somehow on your card. It could be a music related stamp, designer paper, embossing folders, punches etc..... whatever you wish. Of course if you have Elvis stamps you get double points hehe!" I had to DIG DEEP to find some music stamps..........you know what is incredibly insane about this? I AM a musician. I play Guitar, Piano, Saxophone and my first love is Vocals..........you'd think with enough stamps to fill a U-Haul, I'd have a boatload of Music stamps.....but NOPE, I am Music stamp challenged. That being said, I have this stamp and I adore it! 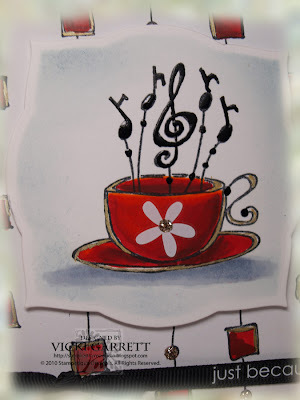 It's Musical Cup from Stampotique 2113. The Background Stamp is called Strung, also available at Stampotique. I coloured the stamp with Copic Markers (r27 and r59 for shading, yr16 for highlighting). Then I added this cute flower rub on for some additional detail. The edging on the cup and red areas of the background stamp are filled with gold gel pen. Another little rub on on the black ribbon completes the card. I used some Sakura Glaze Pen on the Musical notes to add a little more dimension! Lastly, I added some Platinum Stickles to the circular elements on the background stamp and to the middle of the floral rub on. I rarely revere in my creations, but I have to tell you that I LOVE the way this card turned out. There's just something about it that says fun and funky! Hope you enjoy it too! If you would like to play along with us, all you have to do is create a card/project, and upload it to your blog and/or to your SCS Gallery using the keyword C4C50. Don't forget to go back to the C4C blog and link it on Mr Linky so that everyone else can see it too. Kraftin' Kimmie's Spooky Peeks part two! Vic the Vampire with his furry little friend is scouting out the Haunted House for Treats! What's your favourite Halloween Treat? I think that mine are Molasses Kisses........second to Chocolate of course, but you can get Chocolate ANY time of year! Kiss Candies are usually only available at Halloween....... a lot of people DON'T like them, so the cool thing is that I used to trade more common candies for those and I'd have a stock pile that would last me until Christmas! Anyhooooo............ 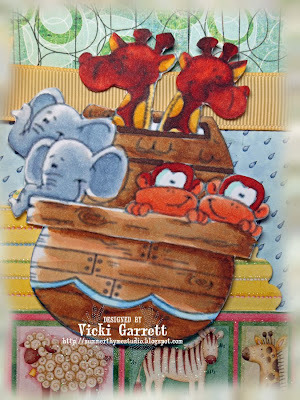 These are two more images along with another sentiment that are being released on Sunday at Kraftin' Kimmie Stamps!!!! Hope you're enjoying all the sneak peeks! I sure am!! 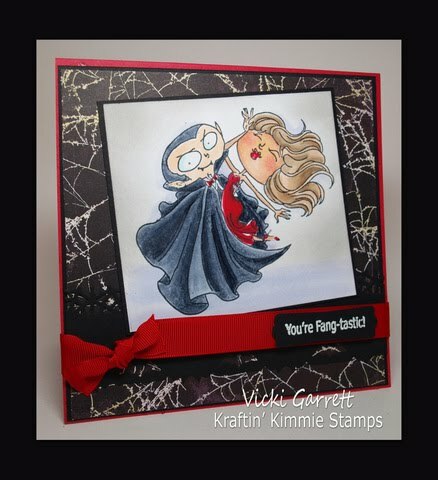 Kraftin' Kimmie's SPPOOOOOOOOKY Sneak Peeks! 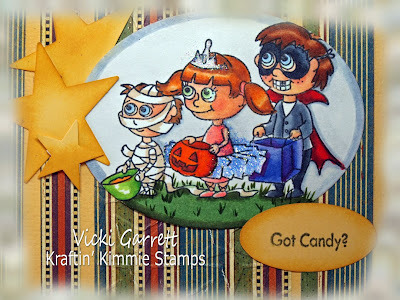 I am SOOOOO excited to share the first sneak peek from Kraftin' Kimmies Spooktacular August Release!!!! Oh my word, I know that every month I say the sets are my fave, but these are absolutely to DIE for!!! Ghosts and Goblins, Trick or Treaters.......and then Miles and Maisie! You're going to be shivering when you see what Kimmie and the DT have in store for you this week!!!! I love this Fred and Ginger Image! 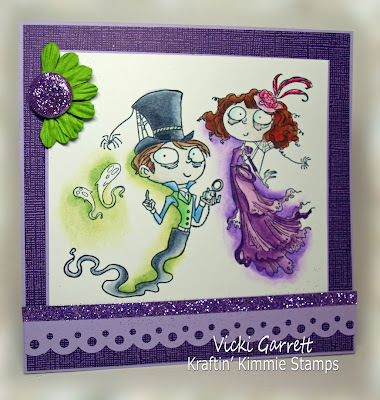 Coupled with Kimmie's Spooky Halloween Sentiment, it makes a perfect Halloween card and could even be an "i'm swooning for you" type of card. All these images will be available on Sunday! 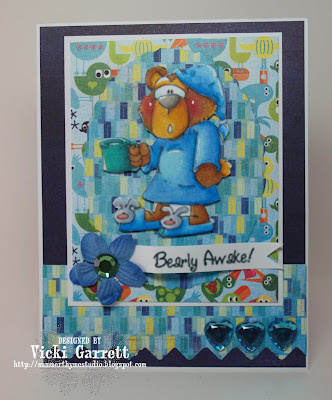 Don't forget the Krafty Blog Hop! Kimmie has some fabulous guest Kraftie's to play along this week with the peeks and hop and of course you can trick or treat for a chance to win some blog candy!!! I coloured the image with Copics. Just a little note about creating Black images. I NEVER NEVER NEVER use black......... It seems flat and doesn't allow you to get much contrast. I use the C series of Gray...........starting with 1 and usually finishing with 7 or 8. Then for the darkest parts, I used Slate, which is in the BV Family! The Designer Paper is from Basic Grey and I embossed the sentiment on black and punched it out with a SU punch! Be sure to check the links on the sidebar to see the super talented Krafty Girl Peeks! I KNOW you won't be disappointed!!! One can never get enough sweets!!! See you tomorrow with more Peeks!!!! 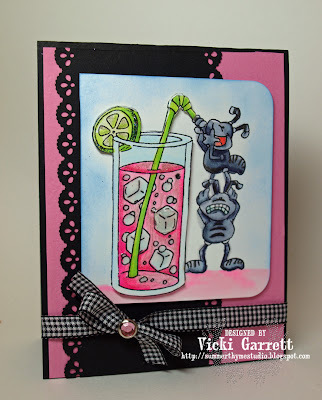 This week, my super talented team friend Lori has challenged us to make a pink card and add a little or a lot "o" bling!!! I LOVE bling...........glitter, rhinestones, crystal effects..........sparkly gel pens...........I'm like a fish attracted to a lure when it comes to bling!!!! So If you would like to play along with our challenge, you can link your creation up to the Paper Romance Challenge Blog One random player will win a $5.00 gift certificate to Amy's Store!!! 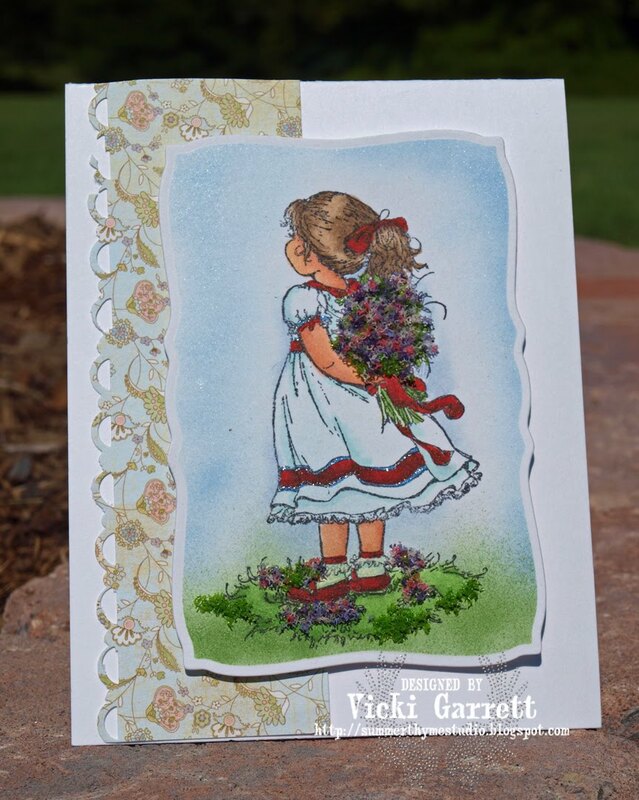 Impression Obsession and Flower Soft Blog Hop! two $25 gift certificates from Impression Obsession!!! The prize winners will be announced on the Flower Soft Blog and The Impression Obsession blog on Wednesday August 18th. 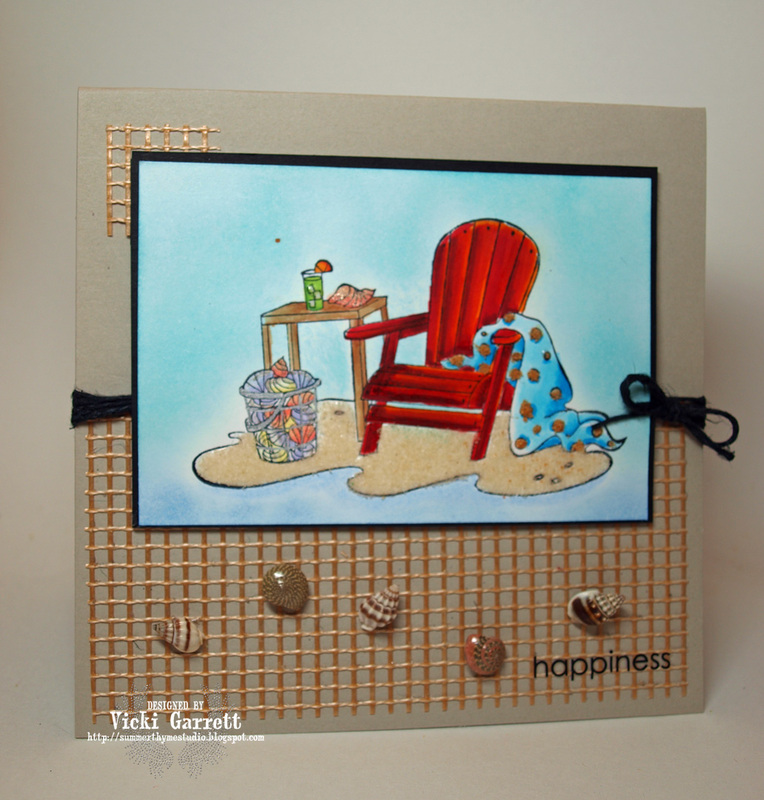 For my Card, I used the Beach Chair Image. I added some Ultrafine Sand Flowersoft to create the sand and a wee bit of Ultrafine Toffee to add some dimension to the towel. I have to tell you that Impression Obsession has so many images that work well with Flower Soft. From Floral scenes, nautical, Americana.........well I could go on and on..........I just have to say that there are so many amazing images to choose from!!!! I kept the card fairly simple with a little Magic Mesh to ground the main image and some hemp and seashells for embellishments. The Rub on is from SU! The image is coloured with Copic Markers! In this challenge the very talented Willy is hosting this week. This week we are going to fly with the theme ‘Wings, wings, wings’. Get out your stamps and fly with us. A Little Later this week, August 11th to be precise, the Design Team Members of Flower Soft and Impression Obsession Stamps are joining forces for a Fun Blog Hop! You won't want to miss all the DT Creations and to see how perfectly the Flower Soft and Impression Obsession Images can be combined for the most beautiful of creations! Be sure to follow the blog this week for all the details on the hop! I'm REALLY looking forward to it! DP and CS : Stampin' Up! Today my Baby Turns 14~! 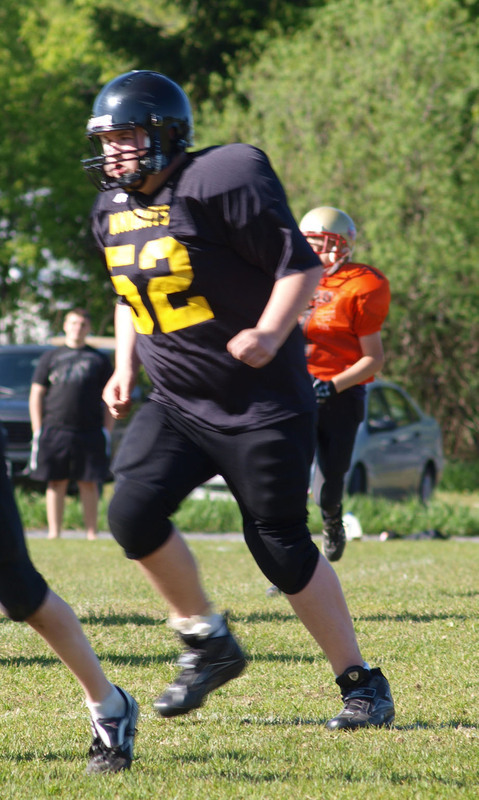 At 6'3" I sometimes forget that my man child is still a child and it's unbelievable to me how the last Fourteen Years has just whizzed by! Every year I get sappy thinking about how I used to cuddle my sweet baby for hours on end.......just looking at him and stroking his soft cheek. Even as a 10 lb 3 oz preemie, my baby seemed so small.......who knew he'd grow and grow and those tiny toes would morph into size fourteen feet!!! Anyway, enough of that! 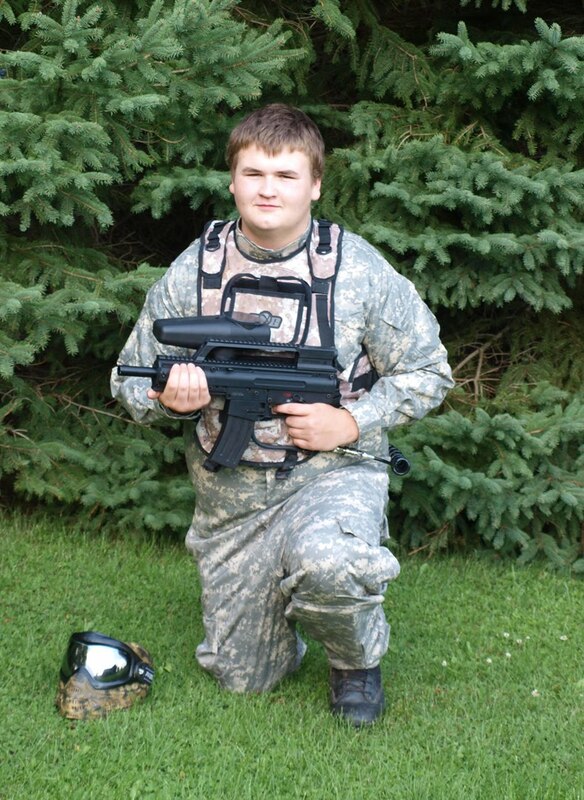 Jonathon starts High School in the fall. I KNOW the next four years are going to fly by even faster then the first 10 years of School! 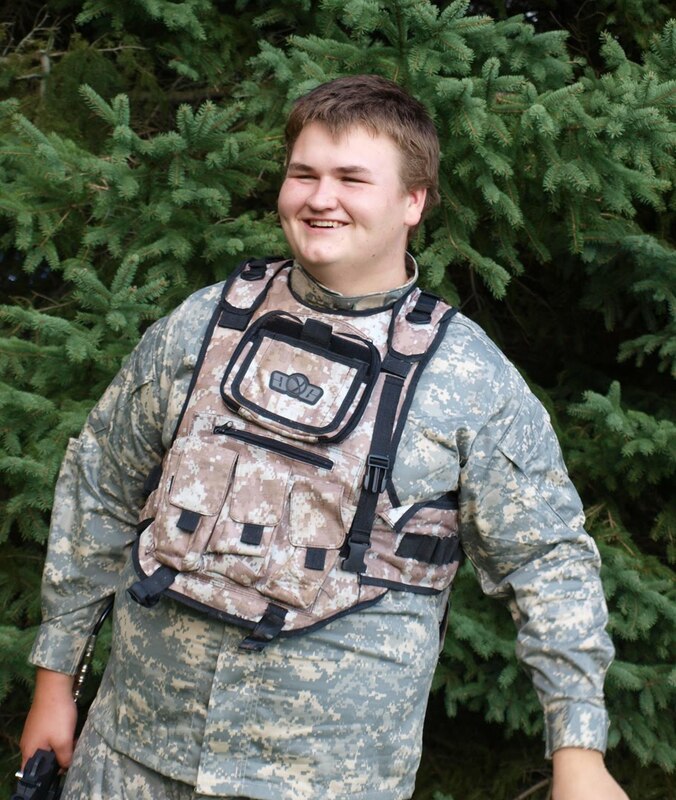 I am so proud of Jonathon and the young man he has become. I love his independence, his dry sense of humour, the gleam in his eye and his cheeky grin. 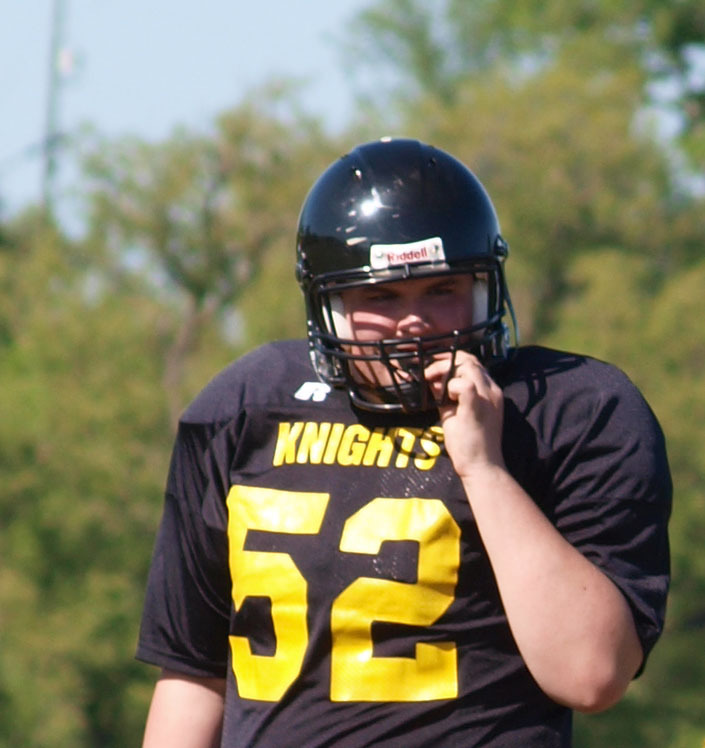 On the Field with the Knights Minor Football. I can't wait to cheer you on at High School Football in the Fall! I love you so much Jon that it still takes my breath away thinking of how amazing motherhood can be...........the good, the bad, the ugly, the joy, the pain of hurting when you hurt and the laughs that we have had since our first shared belly laugh at 6 mos old. Keep growing and maturing and although you won't allow me to hold your hand anymore, I'll always be standing beside you with unconditional love. I know you're a young man now, but you'll always be my baby. Sooo in celebration of Jon's Birthday, I'm hosting the Kraftin' Kimmie Challenge this week! The task-to create a Birthday card suitable for a Boy. Oh my gosh! Wait until you SEE what the Krafty Girls have created! They are AMAZING!!!!! Want to win Surfer Miles??? Be sure to play along with the challenge. 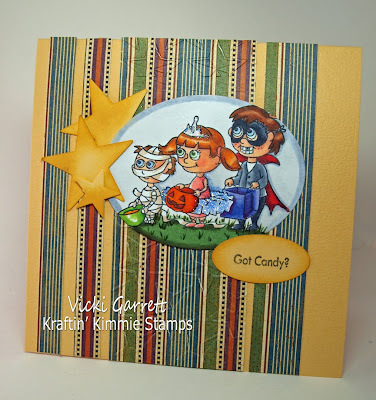 You can get all the details on the Kraftin' Kimmie Blog and Link up your creation there! Don't forget about this fun Krafty event! Hope you'll join us there! I used one of the Beach Sentiments to create this SUN-Sational Birthday card for my best guy! Punch and Chipboard are from SU! Crazy 4 Challenge 49- How Sweet it is! 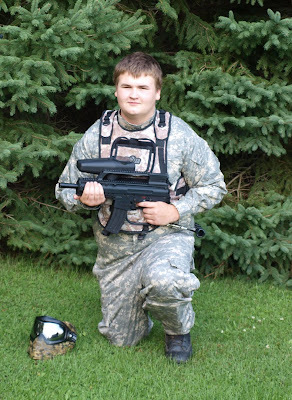 PRC 10- It's a Teen Thing!